CK All 200ml. is a new bright, fresh unisex flavor for men and women. Home » CK All 200ml. Product Code: CK All 200ml. CK All 200ml. EDT is like a new love. He beckons and takes all your feelings, he makes you happy and fills every day with a special meaning. Be seduced by the new composition from the famous French brand Calvin Klein - and you will not want to get rid of this captivating feeling! Eau de toilette CK All gives oriental-citrus pleasure, which will be appreciated by both men and women. A juicy cocktail of ripe bergamot and mandarin with their sweetness, light sourness and expressive bitterness begins the opening of the fragrance. He sparkles and plays, shimmers with different faces. Here you feel the whiff of a breeze bringing aromas of jasmine, lilies and white freesia. Here is a light sour rhubarb. The combination of vetiver, amber and musk gives the perfume depth and expressiveness. 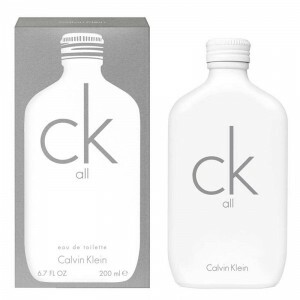 Calvin Klein CK All - a new highlight of your image!